Tongue cancer is a type of head and neck cancer. Symptoms can include a patch, spot or lump on your tongue that doesn't go away. The main risk factors are smoking, drinking a lot of alcohol and infection with the HPV virus. Cancer can develop in either part. The oral tongue is the part you see when you poke your tongue out at someone. This is the front two thirds of your tongue. Cancers that develop in this part of the tongue come under a group of cancers called mouth (oral) cancer. 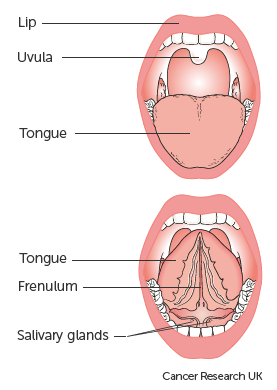 The base of the tongue is the back third of the tongue. This part is very near your throat (pharynx). 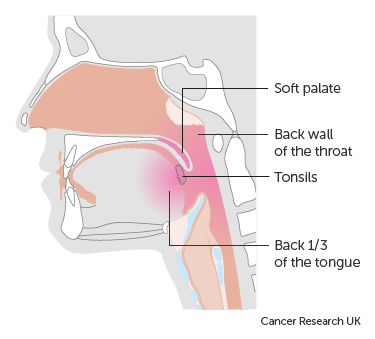 Cancers that develop in this part are called oropharyngeal cancers (pronounced oar-o-farin-gee-al). The most common type of tongue cancer is squamous cell carcinoma (SCC). Squamous cells are the flat, skin like cells that cover the lining of the mouth, nose, larynx, thyroid and throat. Squamous cell carcinoma is the name for a cancer that starts in these cells. It's important to remember that these symptoms might be due to a less serious medical condition. But it's best to check symptoms with your GP just to make sure. The photos below give you an idea of what tongue cancers can look like, but remember that they might appear differently from this. Contact your GP or dentist if you notice anything abnormal. This picture shows cancer on the side of the tongue. And below is a picture of a red patch underneath the tongue. We don’t know the exact causes of most head and neck cancers, but several risk factors have been identified. Smoking tobacco (cigarettes, cigars and pipes) and drinking a lot of alcohol are the main risk factors for cancers of the head and neck in the western world. The HPV virus transmitted through sexual contact is another risk factor. Having a risk factors means that your risk is increased. But it does not mean that you will definitely develop cancer.